Fu-Ki Japanese Steakhouse & Sushi has an ambitious menu with wide-ranging appeal. 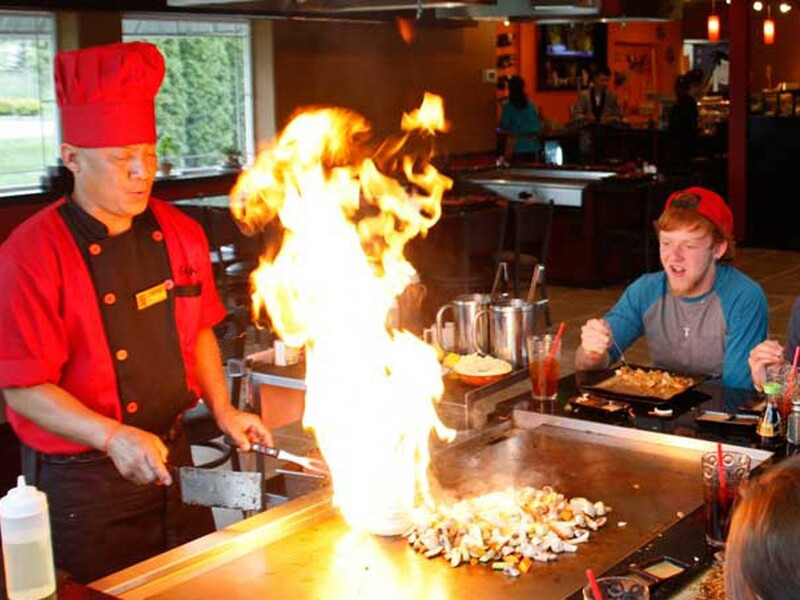 On the teppan-yaki side is the campy showmanship of expert chefs performing edible theatrics with your meal. In the smaller sushi area, cooks quietly create artful little plates in the new Post Falls restaurant. The teppan menu is plentiful and varied. Soup, vegetables and fried rice are included with lunch ($7.50-14.95) with chicken, seafood or steak. Dinner includes onion soup, shrimp appetizer, vegetables and steamed rice with a greater range in prices and options from teriyaki chicken ($14) to fish of the day ($19) to lobster ($33) or even Kobe beef ($45). A children’s menu ($6.50-9.50 lunch, $8-11 dinner), large group seating, plus the aforementioned theatrics make this ideal for families or parties. It’s Americanized Japanese food, for sure, especially the teppan-style cooking over iron griddles first popularized in the ’60s by Hiroaki “Rocky” Aoki of the Benihana restaurant empire. The flaming onion volcano, food morsels flipped into the open mouths of daring diners, the chop-chop-chop and sizzle sounds of the griddle. It’s all in good fun and an admitted novelty. For a less boisterous dining experience, sit along the sushi bar where chef Jackie Wang might make you a little edible sculpture. Start with seaweed salad ($5) or some appetizers (try crispy sashimi chips $11). Calamari Roll is rice-outside (surimi) crabmeat and avocado topped with tempura calamari and sweet eel sauce ($8). In addition to the usual sushi suspects — California, tuna, veggie — 42 special rolls vary in complexity and hotness. The Kiss of Fire, indicated by three chili peppers on the menu, is albacore and spicy tuna, avocado, green onion and hot sauce ($11). Their sashimi selection runs the gamut, too, from more common sake ($14.95/5 pieces) to aji (a type of Spanish mackerel; $14).